GlutenFree.com is your online source of gluten-free food for Celiac Disease, wheat & gluten intolerance, wheat allergies and multiple food allergies. Choose from the biggest brand-names such as Glutino, Gluten-Free Pantry, Bi-Aglut, Bakery on Main, Bob's Red Mill, Cherrybrook Kitchen, Cream Hill Estates, Crunchmasters, Dr. Schar, Ener-G, Enjoy Life Foods, Jo-Sef, Kinnikinnick, Maxwell's Kitchen, Namaste, Nature's Path, Organ, Pamela's Products, Perky's, Premier Japan, PureFit, Really Great Food, San-J, Shelton's, Thai Kitchen, Think Thin,Tinkyada, Zojirushi, and more. Gluten Free selection includes a wide array of delicious gluten-free and wheat-free gourmet baking mixes, breads, bagels and baguettes, crackers, cookies, pretzels, snacks, pastas, beverages, vitamins, convenience and prepared meals, baking ingredients, condiments, books, and so much more. With 58coupons you can get the best deals on Gluten Free items with special promotions, discounts and coupon codes. For a limited time you can save up to 35% on select items in the specials section at Gluten Free. Click link. Enjoy free shipping on orders over $100 from Gluten Free with this promo code. Click link to start shopping. 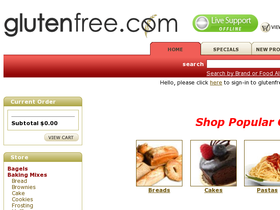 Save 10% on orders over $100 from Gluten Free when you use this code at checkout. Click link to begin. Visit Gluten Free today and save $1 on all breakfast bars with this coupon code. Click link to see the selection.